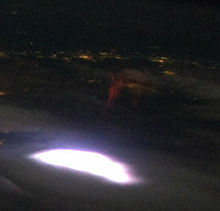 A sprite seen from the International Space Station (top right, faint red above the lightning). Sprites appear as luminous reddish-orange flashes. They often occur in clusters above the troposphere at an altitude range of 50–90 km (31–56 mi). Sporadic visual reports of sprites go back at least to 1886, but they were first photographed on July 6, 1989 by scientists from the University of Minnesota and have subsequently been captured in video recordings many thousands of times. Sprites are sometimes inaccurately called upper-atmospheric lightning. However, sprites are cold plasma phenomena that lack the hot channel temperatures of tropospheric lightning, so they are more akin to fluorescent tube discharges than to lightning discharges. Allusions to transient optical phenomena above thunderclouds can be found in anecdotal reports by Johann Georg Estor as early as 1730. Nobel laureate C. T. R. Wilson had suggested in 1925, on theoretical grounds, that electrical breakdown could occur in the upper atmosphere, and in 1956 he witnessed what possibly could have been a sprite. They were first documented photographically on July 6, 1989, when scientists from the University of Minnesota, using a low-light video camera, accidentally captured the first image of what would subsequently become known as a sprite. Several years after their discovery they were named sprites (air spirits) after their elusive nature. Since their 1989 discovery, sprites have been imaged from the ground, from aircraft and from space, and have become the subject of intensive investigations. Sprites have been observed over North America, Central America, South America, Europe, Central Africa (Zaire), Australia, the Sea of Japan and Asia and are believed to occur during most large thunderstorm systems. Three types of sprites have been categorized by Matthew 'Geoff' McHarg Ph.D. (U.AK) of the US Air Force Research Academy (and NASA). Using an image intensifier on the front of super slow motion camera McHarg and his researchers have named the sprites based on their visual appearance. Jellyfish sprite – very large, up to 30 by 30 miles (48 by 48 km). Column sprite (C-sprite) – large scale electrical discharges above the earth that are still not totally understood. Carrot sprite – a column sprite with long tendrils. Sprites are colored reddish-orange in their upper regions, with bluish hanging tendrils below, and can be preceded by a reddish halo. 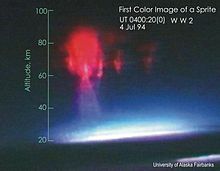 They last longer than normal lower stratospheric discharges, which last typically a few milliseconds, and are usually triggered by the discharges of positive lightning between the thundercloud and the ground, although sprites generated by negative ground flashes have also been observed. They often occur in clusters of two or more, and typically span the altitude range 50 to 90 kilometres (31 to 56 mi), with what appear to be tendrils hanging below, and branches reaching above. Optical imaging using a 10,000 frame-per-second high speed camera shows that sprites are actually clusters of small, decameter-sized (10–100 m or 33–328 ft) balls of ionization that are launched at an altitude of about 80 km (50 mi) and then move downward at speeds of up to ten percent the speed of light, followed a few milliseconds later by a separate set of upward moving balls of ionization. Sprites may be horizontally displaced by up to 50 km (31 mi) from the location of the underlying lightning strike, with a time delay following the lightning that is typically a few milliseconds, but on rare occasions may be up to 100 milliseconds. This footage from the ISS shows a red sprite over East Asia at around 0:06. In order to film sprites from Earth, special conditions must be present: 150–500 km (93–311 mi) of clear view to a powerful thunderstorm with positive lightning between cloud and ground, red-sensitive recording equipment, and a black unlit sky. Sprites are sometimes preceded, by about 1 millisecond, by a sprite halo, a pancake-shaped region of weak, transient optical emissions approximately 50 kilometres (31 mi) across and 10 kilometres (6.2 mi) thick. The halo is centered at about 70 kilometres (43 mi) altitude above the initiating lightning strike. These halos are thought to be produced by the same physical process that produces sprites, but for which the ionization is too weak to cross the threshold required for streamer formation. They are sometimes mistaken for ELVES, due to their visual similarity and short duration. Research carried out at Stanford University in 2000 indicates that, unlike sprites with bright vertical columnar structure, occurrence of sprite halos is not unusual in association with normal (negative) lightning discharges. Research in 2004 by scientists from Tohoku University found that very low frequency emissions occur at the same time as the sprite, indicating that a discharge within the cloud may generate the sprites. Sprites have been blamed for otherwise unexplained accidents involving high altitude vehicular operations above thunderstorms. One example of this is the malfunction of a NASA stratospheric balloon launched on June 6, 1989 from Palestine, Texas. The balloon suffered an uncommanded payload release while flying at 120,000 feet (37,000 m) over a thunderstorm near Graham, Texas. Months after the accident, an investigation concluded that a "bolt of lightning" traveling upward from the clouds provoked the incident. The attribution of the accident to a sprite was made retroactively, since this term was not coined until late 1993. ^ Walter A. Lyons and Michey D. Schmidt (2003). P1.39 The Discovery of Red Sprites as an Opportunity For Informal Science Education. American Meteorological Society. Retrieved on 2009-02-18. ^ a b c Sentman, D.D. ; Wescott, E. M.; Osborne, D. L.; Hampton, D. L.; Heavner, M. J. (1995). "Preliminary results from the Sprites94 aircraft campaign: 1. Red Sprites". Geophys. Res. Lett. 22 (10): 1205–1208. Bibcode:1995GeoRL..22.1205S. doi:10.1029/95GL00583. ^ Kathy Berry (1994). Spectacular Color Flashes Recorded Above Electrical Storms. NASA. Retrieved on 2009-02-18. ^ Don Savage and Kathy Berry (1995). Sprites Confirmed Over Storms Outside U.S. For First Time. NASA. Retrieved on 2009-02-18. ^ McHarg, Haaland, Moudry and Stenbeik-Nielsen (2002). Altitude-time development of sprites. Retrieved on 20-09-21. ^ Boccippio, D. J.; Williams, ER; Heckman, SJ; Lyons, WA; Baker, IT; Boldi, R (August 1995). "Sprites, ELF Transients, and Positive Ground Strokes". Science. 269 (5227): 1088–1091. Bibcode:1995Sci...269.1088B. doi:10.1126/science.269.5227.1088. PMID 17755531. ^ Lu, Gaopeng; Cummer, Steven A; Blakeslee, Richard J; Weiss, Stephanie; Beasley, William H (2012). "Lightning morphology and impulse charge moment change of high peak current negative strokes". Journal of Geophysical Research: Atmospheres. 117 (D4): n/a. Bibcode:2012JGRD..117.4212L. CiteSeerX 10.1.1.308.9842. doi:10.1029/2011JD016890. ^ Stenbaek-Nielsen, H. C.; McHarg, M.G. ; Kanmae, T.; Sentman, D.D. (June 6, 2007). "Observed emission rates in sprite streamer heads". Geophys. Res. Lett. 34 (11): L11105. Bibcode:2007GeoRL..3411105S. doi:10.1029/2007GL029881. L11105. ^ Grønne, Jesper. "Første danske 'red sprites' fanget fra Silkeborg" Archived August 22, 2012, at the Wayback Machine Danish Meteorological Institute, 20 August 2012. Retrieved: 20 August 2012. ^ Christopher Barrington Leigh (2000). Sprite halos. Archived 2008-09-17 at the Wayback Machine Stanford University. Retrieved on 2008-02-18. ^ a b Barrington-Leigh, C. P., U. S. Inan, and M. Stanley, "Identification of Sprites and Elves with Intensified Video and Broadband Array Photometry", J. Geophys. Res. 106, No. 2, February, 2001. ^ Ohkubo, A.; Fukunishi, H.; Takahashi, Y.; Adachi, T. (2005). "VLF/ELF sferic evidence for in-cloud discharge activity producing sprites". Geophysical Research Letters. 32 (4): L04812. Bibcode:2005GeoRL..32.4812O. doi:10.1029/2004GL021943. ^ STRATOCAT (2009). "Data of the stratospheric balloon launched on 6/5/1989 from Columbia Scientific Balloon Facility, Palestine, Texas, US for Molecules observation made fluorescent with a Laser". Retrieved 2009-02-18. Wikimedia Commons has media related to Sprites (lightning). Kanmae, T.; Stenbaek-Nielsen, H.C.; McHarg, M.G. ; Haaland, R.K. (2010). "Observation of blue sprite spectra at 10,000 fps". Geophys. Res. Lett. 37 (13): L13808. Bibcode:2010GeoRL..3713808K. doi:10.1029/2010GL043739.